There are many different options when it comes to adding accent lighting to a touring model Harley Davidson. There are a number of things to consider before choosing an accent light especially if you are planning to do the installation yourself. There are various kits that differ greatly in price and lighting style. It is important to know if a kit will require the additional purchase of items such as a load equalizer, a module, a switch etc. Difficulty of installation is another factor that should be considered. 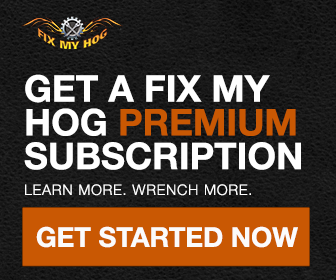 Some kits are simple plug and play while other kits require cutting and soldering wires or drilling and cutting motorcycle components or painted pieces. Recently, In The Shop, we have installed a number of Kuryakyn’s spear style saddlebag accents. 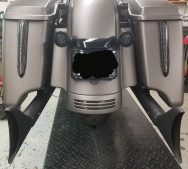 These LED lights not only have an eye catching style; more importantly, they operate as running, turn, and brake lights, making the motorcycle more easily visible to traffic. The job can be considered easy to moderate as far as difficulty. Wiring is plug and play but there is a little bit of measuring, drilling, and cutting that is required. Installation can be a little tedious especially when there is a margin for error that may leave an unsightly outcome. Taking your time and practicing patience goes a long way with this kit. Start by positioning the accents. Use masking tape and a marker to make temporary alignment marks on the saddlebags. Make a mark on the saddlebag where the wiring exits the top of the accent, then remove the accent. 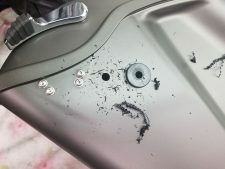 Use a file or die grinder to remove about a 1/4” of material from the flange on the top edge of the saddlebag. Next, remove saddlebags from the motorcycle and lay on a clean, soft surface. 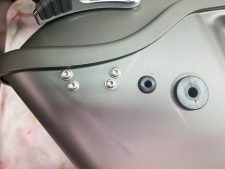 Drill one 5/16″ hole through the back wall of each saddlebag. A rubber grommet is supplied for the hole. Now, with the saddlebags back on the motorcycle, the accents can be mounted using the previously made reference marks as a guide. 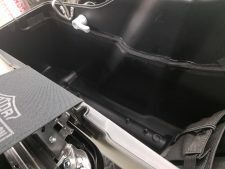 The harness can now be routed and secured within the saddlebag and in the battery area of the motorcycle. The job is complete after plugging in the wires and tidying up any excess wiring beneath the seat.